Victory Venkatesh has played many versatile characters over the years but for the first time ever, he is going to be seen in a sports drama. 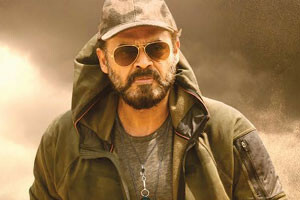 The movie is ‘Guru’ and Venkatesh will be seen in the role of a hard hitting boxing coach. The film has completed its shoot and post-production. Guru has been directed by the National Award winning Sudha Kongara, who has worked with the maestro Mani Ratnam for seven years, before taking up direction herself. The movie is a gritty and realistic sports drama with strong emotions. Ritika Singh and Mumtaz Sorcar will be sharing the screen with Venkatesh in this movie. Ritika Singh is a real life mixed martial arts expert who represented India at the 2009 Asian Indoor Games. She has recently won a National Award as well as a Filmfare Award for Best Debut for the movie “Irudhu Suttru”. Mumtaz Sorcar is the daughter of the legendary magician, P.C. Sorkar. A special lyrical video from the film titled “Aye Sakkanodu” will be released on the 17th of February. The audio album of the film will be released in the first week of March. Guru is aiming for a summer release and the exact release date will be announced soon. Sashikant of Y Not Studios is producing the movie and Santosh Narayanan is composing the music.